Hi there! We NOW have 3 corsos.. Dad (4.5 yrs)Mom (3 yrs) and son (1.5 yrs) Father and son have lived together since the pup was 6 weeks old. Both are well socialized and participate in agility training and protection class every weekend. They compete a couple times a year and we show the son. Last week..we rescued mama…who was living in a vacant house. She is dog aggressive but loves humans. Son has always been so sweet and submissive. Dad used to be that way until the son came in. Now he can get moody…need to work on that. They are both intact – and – have quarrels once in a while over food/toys…but this action is usually initiated by dad. Since mama got here, the kid has been challenging Dad. Growling, snarling, etc when dad tries to get too flirty with mama…who we know has not been spayed. This never happened before. My thoughts…this is an impossible living situation – even if she is spayed. What do you think? It can be an impossible situation, however before I would jump to that conclusion I would have a closer look at your relationship with these dogs. Your younger male is hitting the age where he will be more interested in asserting himself and where the true adults around him will be less interested in writing off his antics to youth and inexperience. I would consider this to be somewhat (but not entirely) a resource guarding problem. Some dogs are more “resource” oriented than others. To what extent is influenced by many factors. The personality of the individual dog, genetics, its age etc., but the number one common factor I have noticed in my years of training when it is negatively impacting a household is when the relationship between the dog(s) and their owner(s) is not structured in such a way to provide clarity as to who is living in who’s house. 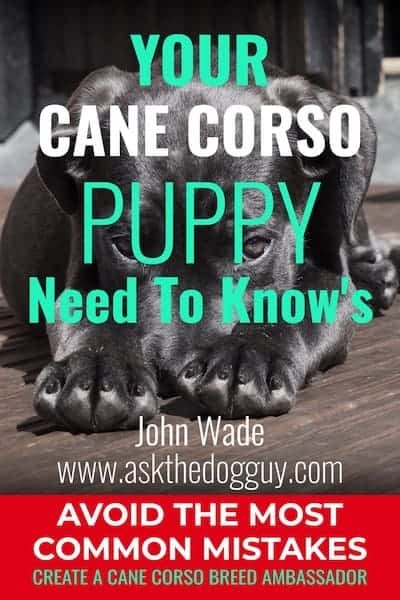 With some dogs it’s not a huge issue but with others and I would say overall that Cane Corso breed in general is one in which you do not want the dog to think it’s living with a great college room mate as opposed to someone with the authority to be respected regarding resource distribution. I often ask clients these three questions when there’s an issue that I think is going to require a rock solid understanding of who is the teacher and who is the student -before- we consider the larger issues they are concerned about. Will your dog when asked to stay do so without the need for treats or your monitoring their every twitch long enough for you to make a cup of coffee? Does your dog come when called around any distraction? Does your dog keep the leash loose regardless of distractions? If not, I wouldn’t necessarily start off thinking that the core problem is one in which the dog(s) are unlikely to be capable of having their behavior modified. It may be. I have certainly had the situation where dogs were incapable of cohabiting with other dogs in peace and harmony but more often than not, it’s a handling problem. In many cases where dogs like your own live in reasonable relative harmony a common element is that the answers the dog owner provides to those earlier three questions is a yes and does not include words like, “Mostly, usually, it depends etc.” My point is that if the dog owner isn’t clearly the one in charge then the dogs are more likely to compete with each other for whatever resources they happen to personally value whether that be food, toys, treats, breeding rights, the affection of a household member etc. There’s only so much of a person left over at the end of the day and living with 3 Cane Corso dogs that get along, is no small feat, living with 3 where there is conflict and having to safely unravel that conflict can be in my opinion grounds for rehoming. It’s fine to say on paper that if you can get the relationship right you can fix this problem, having the information you need to do so, the handling ability and the time to say the least is quite another. You can learn a bit about turning around the relationship by reading my e-book on training difficult dogs – The Beautiful Balance – Dog Training with Nature’s Template. Two puppy’s that have been apart for three months,,always played ruff,now they are 8months old how to reintroduce,without aggression. Exercise them thoroughly apart before they meet for the first (few) times. Meet on territory neither is familiar with. A CO2 fire extinguisher as back up will break up most dog fights without dogs or handlers getting hurt. I introduced a couple of intact adult males, both with “reputations” this way once but they met each other shoulder deep in the lake. They thought about going at each other but thought better and now are best of friends. Have a 6 year old bullmastiff and have added a cane corso puppy this year to the house hold. Now that she has turned about 8 months old she is starting to go after the larger bullmastiff and start a fight with her,she is not spayed yet will this help or is this just how two females will act.